Fannie May is a brand and retailer of chocolates owned by 1-800-Flowers. The company is headquartered in Chicago, Illinois, United States, while the chocolates are manufactured from a facility in Green, Ohio. You can buy Fannie May chocolates from their online store at FannieMay.com and traditional stores located throughout Illinois, Ohio, Florida, and several other states. There are also stores in Canada, bringing the total to over 100 locations. If you want to make savings you can use Fannie May coupons. We list all of the latest deals and offers here at Coupofy, Fannie May printable coupons can be used in store, and you can use coupon codes during the online checkout process. Jim McCann currently serves as CEO, while Chris McCann is President. Fannie May is a contributor to 1-800 Flowers' multi-million yearly revenue. Fannie May traces its roots back to 1920 when H. Teller Archibald opened his flagship chocolate shop in Chicago. It was an immediate success and by the mid 30s there were nearly 50 stores throughout Illinois and neighbouring states. In the post World War II era Fannie was one of the country's most well known chocolate and candy brands as other retailers began to stock their products. The Pixie, Trinidad, and Eggnog Creams became household names for decades. In the 90s Archibald Candy acquired the company, then in 2003 Alpine Confections bought them out, and then in 2006 Fannie May was sold to 1-800 Flowers. Types of chocolate produced by Fannie May include Pixies, Mint Meltaways, Boxed Chocolates, Milk Chocolates, Desserts, Dark Chocolates, Chocolate Strawberries, Chocolate Bars and Squares, and other Chocolate Berries. You can search items via keyword or product number, or browse based on the occasion, such as Father's Day, Birthday, Get Well Soon etc. 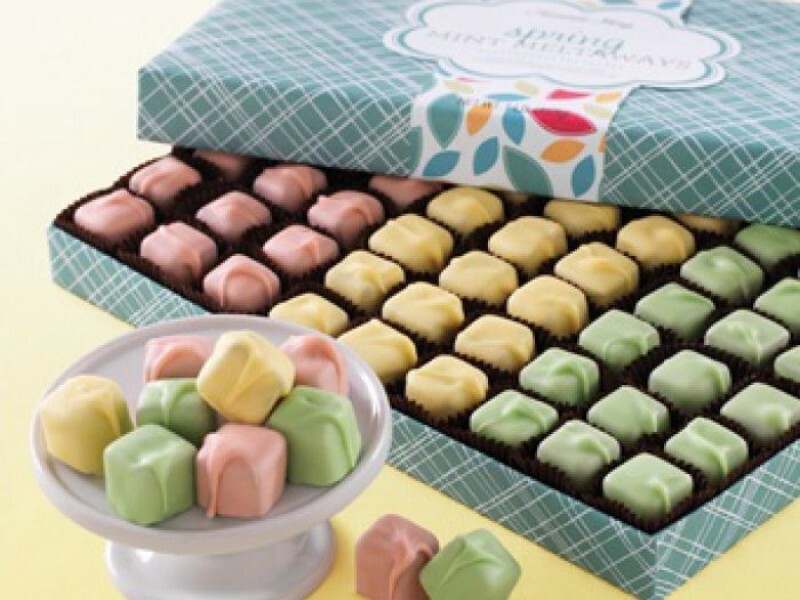 You can also by assortments of several different products, or create your own custom box of chocolates based on the exact type and quantity you desire. To redeem a Fannie May coupon code online simply enter the code in to the promo box ahead of payment. FannieMay.com is a simple to use ecommerce site with product pages and a basket & checkout system. The site currently only serves customers in the United States, though international customers can call to arrange a delivery, which will be subject to an extra $29.99 per item. In the US shipping varies depending on the value of the order. You can also pay extra for 2nd Day, Next Day, and Saturday Delivery. Form time to time you can also use a Fannie May coupon to get free shipping. Due to the nature of their products Fannie May does not accept returns simply because you no longer want the order, however if it arrives in a defective or damaged condition or you are not satisfied for another reason, you can contact customer service to arrange a refund or replacement.